HOUSTON, WE HAVE TOMATOES! I can't believe it, but after picking off all the tomatoes with blossom-end-rot, things started to grow sans buttspot. I can barely relate my joy in words. Picture me doing a little dance around the yard because that is what I did. Pictured above are a few ripe Green Zebras, and ohmygod let me tell you, they taste incredible. Justin Jones, if you are reading this ever, you are a liar. 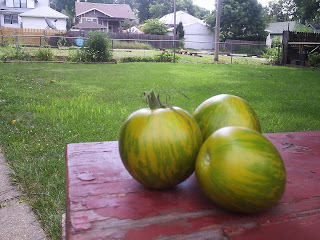 Green Zebras taste just like any other absolutely delicious garden tomato. Also, I think they are prettier and have the benefits of being organic heirlooms. Not to say that my red tomatoes aren't just as delicious. they are slightly thicker-skinned and are growing pretty nicely now. We also have squash now. One day we didn't, the next...bingo. I haven't checked in a day and a half so I bet these suckers are even bigger now. I was just told yesterday that squash blossoms make for some good eatin' and that I ought look up some recipes online for them. Only like, 4 minutes later as I was reading in Plenty-Eating Locally on the 100 Mile Diet the authors gave a recipe for Squash Blossom Soup that sounded pretty good. They said they're good dipped in egg batter and fried as well (but what isn't good fried?). This all happened while I was working the door shift yesterday at the Zoo Bar FAC (Friday Afternoon Club 5-7pm) and it seemed everyone had some input. Willie said I could pull the blossoms off once there was any sign of squash and it'd still grow just fine. Dianne and Sherri were skeptical. So, perhaps if there are still any blossoms when I go garden tomorrow I shall gather them and give them a try. Chop squash flowers, including any attached stems. Melt butter in a large saucepan on medium heat. Add onion and saute until soft and turning golden. Add garlic and flowers and cook 2 minutes more. Stir in salt and chilies. Add soup stock and bring to a low boil. Slowly pour in beaten egg. Remove from heat and cover until egg is cooked. A recipe from Mexico City to the world. 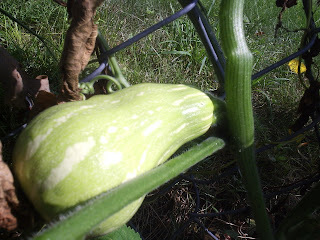 I am thinking I'm going to give it a try provided I have the neccessary squash blossoms. Will report back on whether or not squash grow once you pluck the flower. And, nothing to report on bell peppers...yet. They are (and have been) flowering, but little more. Another note of note, I had a good haul from the farmers market today and am making a lovely salad for lunch...and dinner...and possibly lunch and dinner again tomorrow. It is nearly all local (my favorite salad dressing is Annie's Sesame Shitake not from hereabouts). Bell peppers and salad mix from Shadowbrook farms (near Denton), red onion from a lady that lives right outside Lincoln, eggs (hardboiled) from near Lincoln too, Tomatoes I grew, and cucumber from a friend's garden. Very exciting and incredibly good. Great Photos and Fun Blog post.